CHICESTER, UK -- April 23, 2015: British engineering ingenuity and artistic creativity have proven to be the inspiration behind the naming and creation of the latest Bespoke Phantom Collection to emerge from the Home of Rolls-Royce in Goodwood, England. The Rolls-Royce Phantom Limelight Collection has been conceived for that select group of people who spend their lives in the public eye and on the world stage. Its name was inspired by the origin of a British invention which became synonymous with fame. The limelight effect was originally discovered in the 1820s by Sir Goldsworthy Gurney, a prototypical British gentleman scientist and inventor of the Victorian era. It was harnessed to revolutionise illumination in the theatres of London’s Covent Garden, highlighting leading actors on the stage, thus leading to the phrase, ‘in the limelight’. In common with its sister Phantom Serenity, which was unveiled to the world at last month’s Geneva Salon, Limelight proves once again why Phantom is considered ‘the Best Car in the World’. The Bespoke designers at the Home of Rolls-Royce in Goodwood have used their deep understanding of the habits and behaviours of those powerful people, who make and influence world-changing decisions every day, to create a collection of 25 super-luxury motor cars that cater directly to their busy lives like no other car maker can. Limelight’s wholly new approach to luxury once again sets the benchmark by delighting the most demanding and exacting people in the world – Rolls-Royce customers. 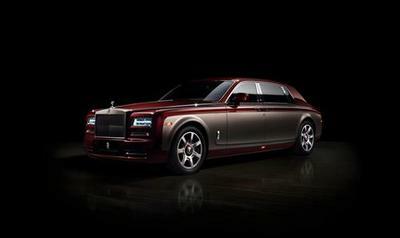 Once again Bespoke IS Rolls-Royce. Whilst mass-luxury car manufacturers simply offer a means of conspicuously getting from A to B in some luxury, Rolls-Royce Motor Cars seeks to understand and exceed the demands of super-luxury customers who are always on the move, preparing to arrive for their next big life moment. With this in mind they have created the “Phantom Suite” comprising unique personalised rear door panniers to ensure cherished personal possessions fall easily to hand for preparing for the next engagement, and a new luxury seating configuration in which to relax in before arriving. Phantom Limelight has thus been conceived as the ultimate travelling companion as its owner moves from major event to momentous occasion, helping them to Prepare, Relax and Arrive for their moment in the limelight in consummate Rolls-Royce luxury. Authentic luxury is only achieved through ultimately understanding the needs and desires of the most discerning patrons in the world – Rolls-Royce customers. From their deep understanding of this specific group of super-luxury clients, the Bespoke design team behind Limelight understood that a number of very human emotions and needs mattered: easy access to one’s favourite, personal possessions in order to prepare for the coming engagement; the opportunity to relax in ultimate luxury once ready and an impactful arrival. For these select people, Phantom Limelight is their very personal concept of authentic luxury. A unique personalised rear door pannier has been designed to ensure cherished personal possessions fall easily to hand. Ladies’ and Gentleman’s panniers are offered to the customer who can personalise their Phantom Limelight with door panniers that best suit their gender preferences. The Ladies’ and the Gentleman’s panniers can also be personalised to suit what particular personal possessions are required for the occasion. In the standard configuration, the Concealed Fragrance Holder for three individual fragrances is located in the top left pocket of the Ladies’ pannier whilst in the Gentlemen’s pannier the concealed section holds watches. The concealed panel opens at an effortless push of the hand. The top right pocket, which is open, contains the fragrance bottles in the Gentlemen’s pannier whilst in the Ladies’ are two watch or jewellery holders. The fragrance bottles, which ensure the passenger always has the right fragrance available to them whatever the time of day, are handmade in the famous Bresle Valley in North West France ­– home to 75% of the world’s luxury bottles for perfumes and spirits. The bottom left pocket houses a universal vanity pouch made of the finest materials, with space for credit cards, business cards, spectacle storage or makeup, whilst Ladies’ and Gentleman’s Accessory Z-Boxes, constructed from carbon fibre, milled in aluminium and hand covered in the finest leathers, complete the door pannier. Once the passengers have prepared for their engagement by choosing their preferred accessories, they sit back and relax in the new Rolls-Royce seat until they reach their destination. The optimum position for relaxing in luxury and safety in the rear compartment of a motor car whilst on the move has long been a subject of debate. Whilst some mass-luxury car makers have gone so far in their wish to install an aircraft-style flat-bed seat in the rear that they have had to created safety devices to compensate for the resulting body posture, Rolls-Royce Motor Cars engineers and ergonomists have worked closely with the medical profession to establish the optimum seat position that relaxes the body most whilst in motion. The result is the new rear seat to feature first in Phantom Limelight. The Phantom Limelight seat back reclines the body by a recommended 27° helping to rest the head on the headrest cushion. Lower down the body, a new calf rest raises electrically by 68° to support the calf, whilst a foot rest emerges out of the floor to raise the feet up to 30°, all contributing to the perfect relaxed posture in motion. Also contributing to the passenger’s relaxation is the choice of two compartment trims as well as several new Bespoke features. The Light contrast scheme features Seashell with Navy Blue Contrast Leather and Seashell tone-on-tone stitching, whilst the Dark contrast scheme offers Navy Blue with Seashell Contrast Leather and Navy tone-on-tone stitching. Complex embroidery inspired by a diamond shape, in homage to the legacy of great Rolls-Royce motor cars of the past, has been applied to the central seat flutes, door cards, rear console and for the first time to the Picnic Table backs. Unique to this Collection and a first for Phantom, is a two-veneer finish that shows off the unique skills of the woodworkers at Rolls-Royce Motor Cars. Piano Seashell specific to this collection is applied to the door cappings, blending the veneer with the leather schemes. Smoked Chestnut completes the colour scheme, the first time that this veneer has been used in Phantom. A specially created Limelight Bespoke Clock draws influence from the rich Gala Blue paint exterior and the diamond motif design that runs throughout the collection. Prepared and relaxed, our passengers arrive for their next engagement clad in the rich but stealthy Gala Blue of Phantom Limelight. Rolling to a halt on its unique nine-spoke alloy wheels, the beautiful motor car features a Seashell and Navy Blue hand-painted coachline with a diamond motif, creating a three dimensional illusion of a diamond bracelet draped over the surface of the car. The Phantom Limelight Collection of 25 cars will be available to order immediately from Rolls-Royce Motor Car dealers around the world.